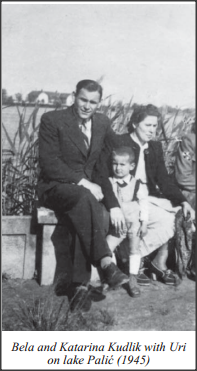 In 1941, at the onset of the invasion of Subotica by Hungarian forces, a Jewish family by the name of Weiss – Josip, Piroshka (nee Spitze), and their son Mirko, born just before the war – lived in the town. Their first neighbours were Katarina and Bela Kudlik. 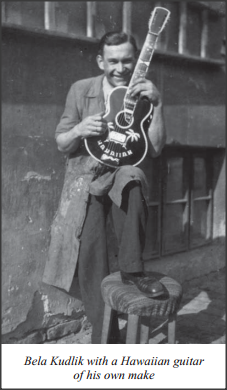 After completing his military service in Prizren, Bela returned to his craft; namely, he was renowned for his skill of making the little “tambura” – a string instrument similar to a mandolin – and the fact that he would often take the opportunity to play his favourite instrument. Katarina and Piroshka were acquainted since their youth but did not have occasion to meet each other often after both had got married. However, Bela’s sister, Tereza, helped the Weiss family with the household chores and this gave the Kudliks an opportunity to meet little Mirko almost every day; a special friendship sprung up between the two families. The Kudliks had no children of their own and they amply bestowed their love on Mirko and on Tereza’s children. Tereza Sabo had six children of her own. In the hard living conditions brought about by the war, the Kudliks decided to help Tereza by adopting her daughter, Julijana – Juca. On moving in to live with the Kudliks, Juca found a new home and enjoyed the love of her newly-adopted parents. upying forces were obliged to enforce anti-Jewish regulations, dictated by the Nazi regime in Germany, in the zones that came under their authority upon the capitulation of the Kingdom of Yugoslavia. In actions undertaken by Hungarian Fascists, Serbian patriots, Communists, and all those considered undesirables by the new regime perished side by side. When it came to Jews, the aim of the Nazi ideology was to exterminate them to the last. Upon the occupation, Mirko’s father, Josip, was immediately sent to forced labour, while Piroshka was left at home alone with her little child. She neither had any knowledge of what was happening to her husband, nor of his whereabouts. Up to1943, Piroshka somehow managed to protect herself and her son Mirko from Fascist raids. When she received a summons to report to the occupying authorities on a daily basis, she was filled with dread that something terrible was about to happen and decided to ask the Kudliks to take Mirko in. “I have brought you what I hold most dear in my life,” Piroshka told Katarina, placing little Mirko in front of her. “Please, look after him as you see fit; take him to be baptized in the church…name him Pista,” Piroshka was having increasing difficulty to find the right words. “Give him all the love you can instead of me,” she said. Her hand went up to her throat as if she could stop her tears by doing so; then she turned around and left. Caught unaware, Katarina started: Juca was already living with them and the threat of Bela being drafted and sent to the front was growing with each day. She hurried out to catch up with Piroshka, but when she reached the street, Piroshka was nowhere to be seen. That was the last time Katarina ever saw Mirko’s mother. Piroshka had written a letter, which she left behind with Mirko, asking the Kudliks to keep the child in their care and not to give him away to anyone else; she promised to return, firmly believing that her husband would come back as well, and that they would both be once again reunited with their son, Mirko. ly, Katarina and Bela decided to change Mirko’s identity. Katarina told everyone that they had taken in her brother’s daughter! So all of a sudden, Mirko became Marika. However, when a Hungarian officer was temporarily stationed in their house, they were faced with a new problem. After returning from work, the officer would ask for Marika’s company; he enjoyed playing with “her”, perhaps to relax after his mentally exhausting job, or maybe “she” reminded him of a child left home behind, waiting for his return. Therefore, he gave all his attention to this other child before him. The Kudliks realized that they could not pass Mirko off as a girl much longer. Through their connections, they baptized Mirko in a Catholic church. According to Piroshka’s wish, he was christened Stevan – Pista. Although Katarina had no idea why Piroshka had chosen that particular name, she was, nevertheless, satisfied to have fulfilled her request. During the raids and ransacking of homes, the Kudliks used to hide Mirko in the shelter they had made in their backyard. Mirko was an obedient child; he never made a sound while search of the premises was being conducted, nor did he ever speak to strangers. His life went on, seemingly unperturbed, as he was swathed by the attention and affection of the two people who were not akin to him, but whom he had, nevertheless, come to love as his parents. lna Street. Jews were moved to the enclosed town area. Even in the hardest times, risking his own life, Bela continued to take five litres of milk to the imprisoned Jews each day. While he persisted in his efforts to help the wronged, the occupying authorities daily hunted for Jews who hadn’t given themselves up voluntarily. The Fascists were in a hurry to complete their monstrous task: soon the final transport of Jews from Subotica was dispatched to Nazi camps, predominantly to Auschwitz, via Hungary. The imminent end of the war presented no deterrent to the extinction of Jews. There were still many of those who thought they were fulfilling a sacred duty by reporting Jews who had managed to escape the last transportation train. The destiny of the persecuted people, the uncertainty of their existence, or even their death was of no consequence to them. It became very hard for the Kudliks to continue their life in these conditions. Their neighbours were well aware of their family status, i.e., that they had no children of their own. The identity of the child, evidently not a baby, they had recently taken in, was obvious to all, but no one spoke about it. It was, unfortunately, also clear to those who spared no time to make known to the authorities that they knew of another Jewish child in hiding and to report the people who were giving him shelter. The Kudliks fled from their own house taking Mirko with them and began to hide on the farmsteads around Subotica, mostly on the farmstead of Katarina’s brother Ruf in Verušić. They spent the whole summer staying with him. From time to time, they would return home only to learn that someone had zealously reported them again and that they had to flee town once more. 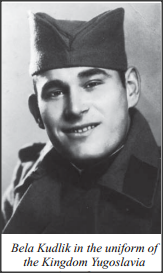 During the bombardment of Subotica in 1944, when household objects and furniture were blown out of the house by the detonations and little Mirko believed it was fireworks that were causing all the commotion, the Kudliks lived out their fear for the safety of Juca and Mirko for the last time. Subotica was finally liberated and the Kudliks no longer had to keep Mirko in hiding. Mirko’s parents never came back; it is believed that Piroshka perished in Auschwitz, while Josip was sent to the Ukrainian front to clear the minefields. Mirko’s life continued under the loving, parental care of the Kudliks. Once freedom was proclaimed, his childhood became carefree and playful, in no way different from that of other children. Soon he was old enough to start school and had just begun to attend classes when, without any prior notice, his aunt Adela arrived at the Kudliks’ door. She had spent the whole war in hiding in Subotica and no one knew whether she was alive or had ended her life in one of the Fascist camps. The Kudliks gave the letter that Mirko’s mother had left with them to Adela. It was a hard moment for Bela and Katarina when they had to give Mirko up: they felt they were losing their own son. Together with Adela, they grieved over the violent death of Mirko’s parents in the war. However, they knew that despite everything, they had to hand the child over to his closest relatives. The bitter memories of their wartime days made Adela and her husband leave for Israel without any second thoughts and resettle there. Of course, they took Mirko with them and he was renamed Uri in Israel. He took along his mother’s letter and the selfless love of the Kudliks, his second parents, with him.